In the past few months requests and inquiries for ‘walk and talk’ sessions have increased, which quite surprised me. However, it also shows that people are perhaps seeking ‘something more’ and are looking for a connection with ‘nature’ and being outdoors instead of a clinic room. Much of our current lifestyles especially in urban areas are increasingly disconnecting us from our natural environment and surroundings. Apart from the fact that it may be ‘different’ to the traditional therapy model of working within the safe space of the walls of a clinical therapy room, it is not actually ‘just’ walking and talking. It may appeal to some people that find traditional ways of working in therapy room quite intense (e.g. being ‘stared’ at by the therapist, ‘feeling put on the spot’, not knowing where to look, feeling extremely uncomfortable with silence or having to sit still, not being able to move while thinking or speaking). It can feel more comfortable when walking side by side, in a more ‘democratic’ space outside – together. But it also may be about much more than that. Though we experience many personal and individual pains and traumas in our lives, these are also experienced on another much larger level of society. Our human symptoms of depression, anxiety, relationship issues, grief and loss or personal crises are also reflected on the level of our modern Western society. Our impulsive desire for instant gratification in a completely anthropocentric (human-centred) consumerist culture along with the increasingly worsening health and crisis state of our planet we inhabit – all facts that we can no longer ignore. We may still resist to believe its relevance or impact on our lives right now, yet we experience the effects of global warming, increasing levels of pollution and species decline now everywhere. I wondered how this is also reflected in how we therapists provide therapy. We are traditionally still trained in ‘person or human-centred therapy’ to individuals with human problems or relational problems with other humans. And yet the impact of our increasingly isolating ego-centrism in our modern current cultures and societies; our increased disconnection from our environment through change in life-styles, the change and loss of extended families and community support and increasingly challenging work-life balance is perhaps bigger than we think. So on another level ‘walk and talk’ therapy (as well as animal-assisted therapy) as part of the ‘eco-therapy’ and ‘eco-psychology’ area, aims to address this disconnection with our environment and non-human or ‘more-than-human’ world as well as with ourselves and in relation to it and the society at large. This really struck even more home when I attended a conference in Ireland this month entitled “Psychotherapy and the Natural World”, about a couple of hours outside of Dublin. It was held in Glendalough, a very ancient monastic site from the 6th century right by the luscious dark green and peaceful Wicklow Mountains. A lot of the latest research was shared about the current art and science of eco-therapy, and therapists and leaders in the field shared case studies and ecological concerns. But we also got a chance to do various experiential exercises outside in the great ancient woods at the foothill of the mountains through group and solo work. 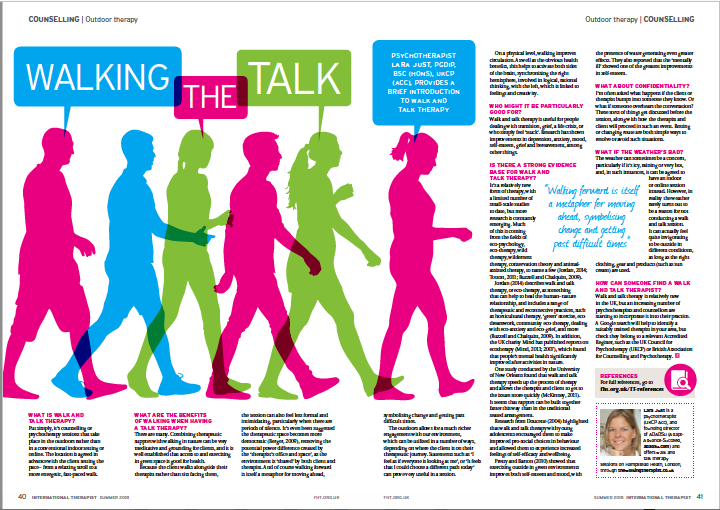 Back in July this year I had a small introductory article published on walk and talk therapy in the International Therapist Magazine, which is mainly geared for complementary medicine practitioners and therapists (you can find a copy of the article here: Walking the Talk Summer 2018. But since then and as a result of the recent conference in Ireland I have come across so much literature that I didn’t even know existed yet. Also, a workshop with Nick Totton (author of “Wild Therapy”) in May had also been extremely useful to learn more and connect with peers in the field. 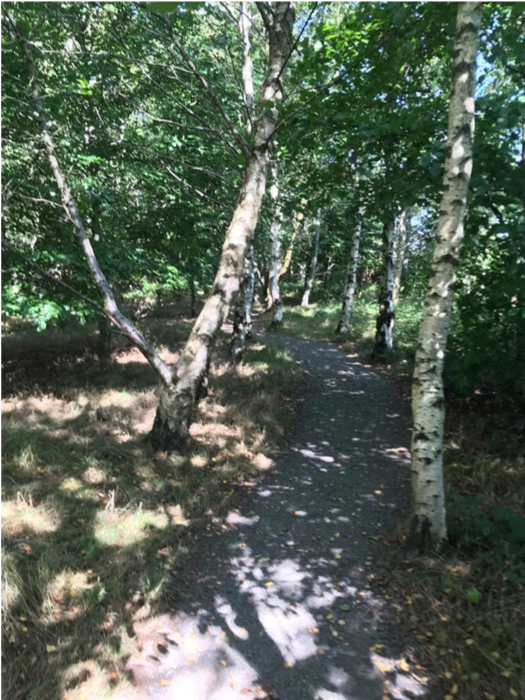 I have shared a mindful walking exercise from the workshop for anyone to try by themselves on my sister website (see here for an exercise from the workshop). There is so much more I could share but will do so over time in other blog articles on these topics. 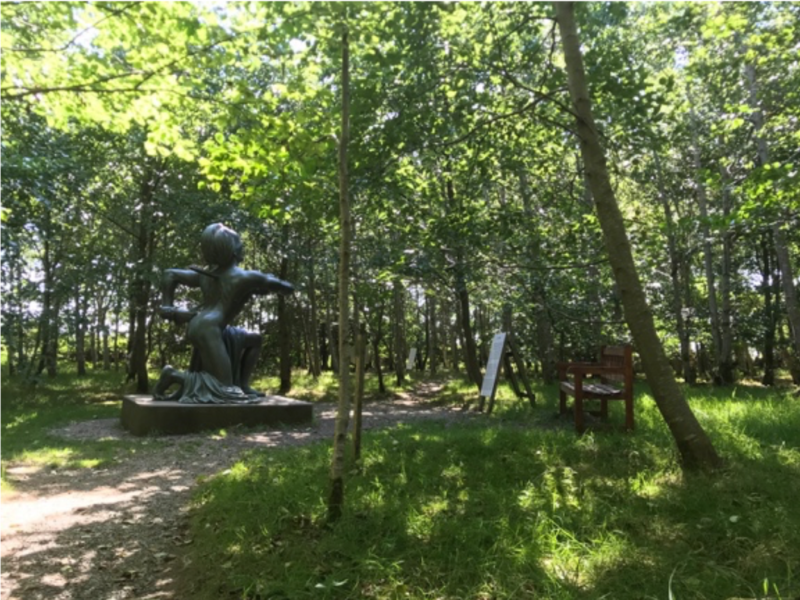 You may also like to check out my latest blog article on our sister website TheWalkingTherapist where I am sharing a photographic meditative journey of my visit to ‘Victor’s Way’ in Ireland with its many thought-provoking sculptures and its accompanying reflective descriptions. So on the one hand it is still a ‘new’ field developing from the traditional psychotherapy where psychology is combined with ecology – and ideally sociology. But really its an ‘old’ natural practice! We are perhaps just finding our way back to it again, noticing that the current disconnect is not helping us to get better. Motivations for therapists to take therapy outside may be varied but many seem to have similarities in their stories that often link to re-discovering the lost healing connection with nature. Interest from therapists also is starting to come together from many different modalities and therapy frameworks. To top this month off, I have been asked to write an article in a European academic peer-reviewed journal to introduce the topic by the beginning of next year. This is exciting and a bit scary as this is my first time for major published article in this field… It has also gotten me into reading and reviewing a large number of literature on the topic – which will keep me busy and will give much more food for thought for other blog topics no doubt. For more information on walk and talk therapy see here or our sister website www.TheWalkingTherapist.co.uk. 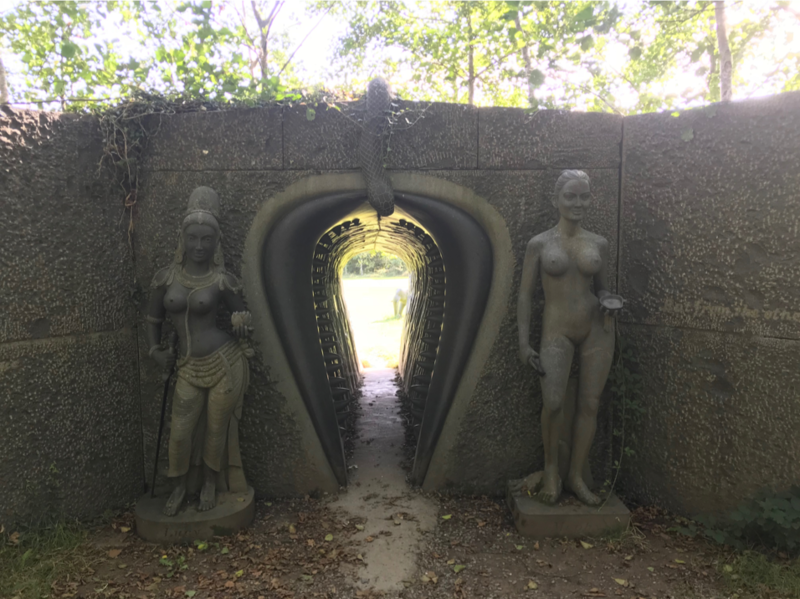 This entry was posted in Eco-Therapy on 21st September 2018 by lara.